With Kajabi, users may generate digital products such as membership sites, online courses and training portal sites effectively and efficiently. In order to build engaging and aesthetic product content, users can create customizable themes, stream videos, add file downloads and upload images and sound. Users may also bring all of their products together onto one site using one login, a personalized URL and an integrated site to aid in acquiring subscribers. Other than digital content production, Kajabi facilitates sales, marketing and client engagement. Since Kajabi affiliates with Stripe, users can secure straightforward electronic payments. To simplify marketing strategies, Kajabi entitles users to design custom forms and landing pages very easily. Users can also send email broadcasts and thereafter track their performance with Kajabi’s email analytics. Kajabi embraces a number of built-in integrations with applications like Infusionsoft, Google Analytics and Infusionsoft authorizing users to manage their online products and share their digital content effortlessly. Kajabi has excellent tools for creating landing pages and sales funnels, and converting site visitors into customers. You may also organize all of your email marketing within Kajabi – including automated follow-up sequences – so, there’s no need for a third party platform (though it does integrate easily with Aweber, Mailchimp, and Active Campaign). In general, Kajabi is ahead of most other online course programs in the native advertising and selling capabilities it provides. 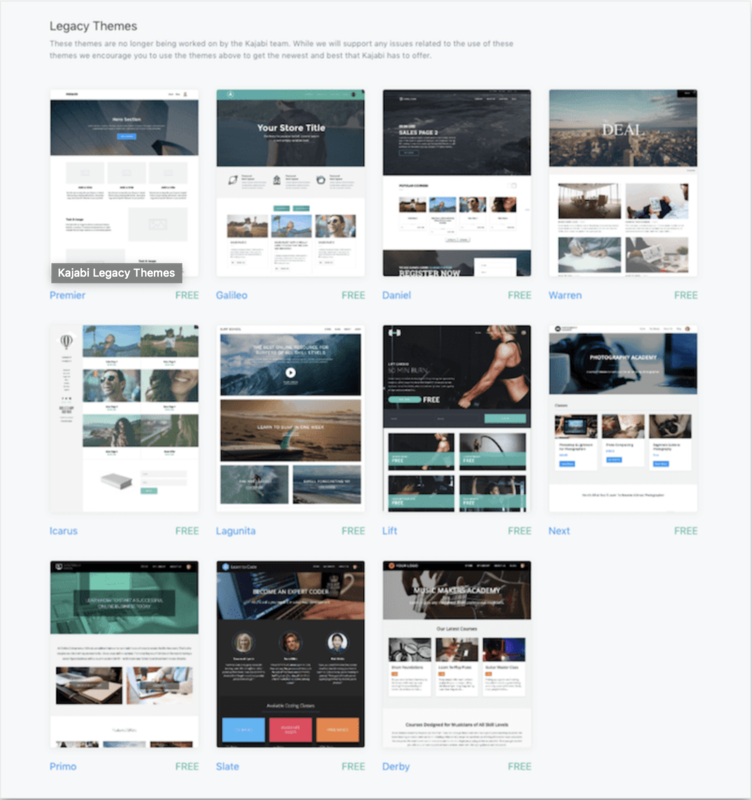 Kajabi provides several variations on a core site theme that looks modern and professional and additionally, it offers very attractive, functional templates for making your landing pages and sales pipeline pages. There’s also a market for custom, premium themes if you don’t wish to go with what Kajabi provides. When it is about actually building your site, Kajabi has pre-designed themes that you can install with a single click. The themes set the overall appearance and style of your site and help you easily and quickly build a good looking site. Kajabi is actually taking a different approach with their website themes now. They’ve archived 10 of the 11 themes and are currently focusing only on the Premier Theme. They’ve developed the Premier Theme into a super flexible framework and they use it to create all the new site themes. 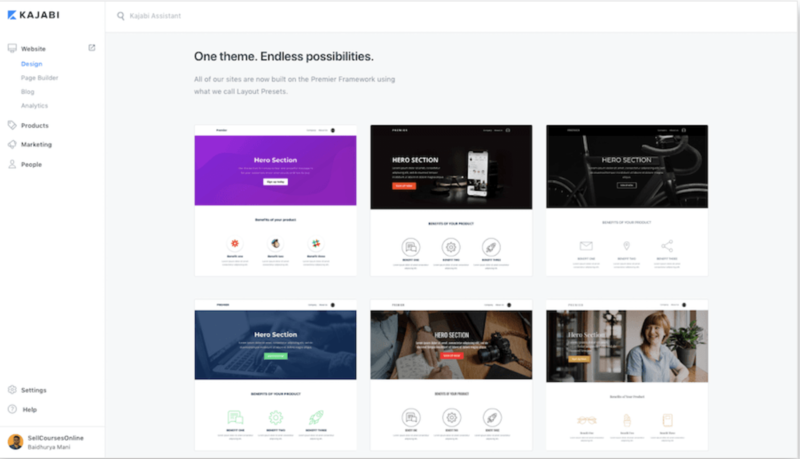 These themes are now called Layout Presets and currently there are 6 different Presets ready for use in their library, all of which can be created on the”Premier Framework”. All of the Layout Presets have a clean and contemporary design and they do look exceptional. As soon as you install a Preset, you can further modify it with the webpage builder to provide your website the look and feel you like. You can still use any of the 10 themes that have recently been moved to the Legacy Themes archive if you would like. Although, since Kajabi will not be working to develop them anymore, I will recommend that you use only the Premier Theme for your site. Finally, Kajabi also gives you the option to import and utilize custom themes. So, if you’re a power user, you can hire a developer to construct a completely custom theme for your site. Kajabi utilizes Wistia – among the all-around top video hosting platforms – completely integrated for streaming and uploading your videos. As a result of this you can be assured that your videos will work as well as possible for whatever screen or bandwidth any individual customer is using — and that they will be as safe as possible. Kajabi has existed for quite some time. Due to this, there are plenty of companies out there that have designed custom themes for it (as mentioned previously) and that provide a selection of services to support it. Additionally, there are plenty of articles and blog posts out there addressing just about anything you want to do with Kajabi. If you can not find what you want through the business’ own support and training – which are quite good – you will most likely be able to find it out on the internet. 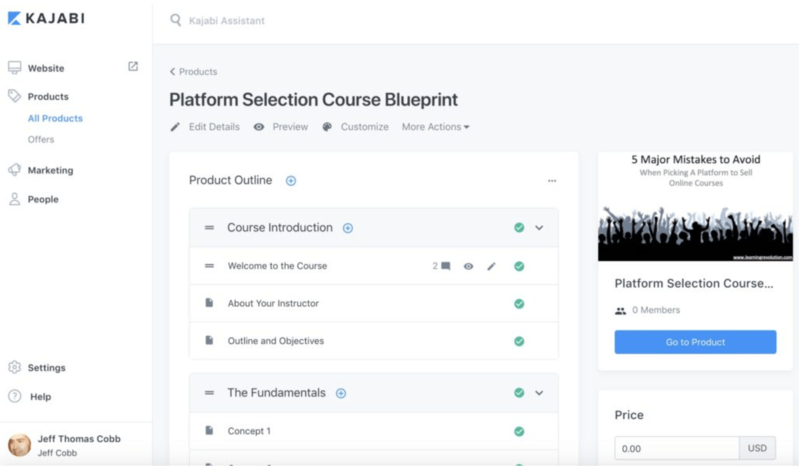 In general, Kajabi will give you a lot more power than most course platforms over creating a website where you can provide your courses but also manage the entire Web presence for your business. To put it differently, you don’t need to establish a separate website on WordPress or another platform – a Kajabi site can become your home base. In the past, I’ve seen online course platforms offering free programs, and some low-priced ones around $20. However, it seems like you usually get the best features about the $50 to $100 pricing. 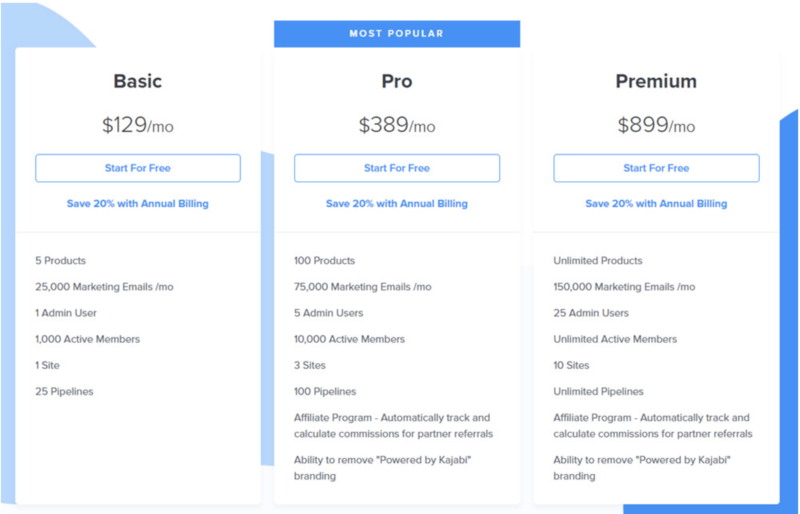 When you take a look at Kajabi, it is surely going to look like the pricing is a little off the charts. The least expensive of these plans is $103 per month, and that is when you pay annually. It’s not exactly what online course startups want to hear, but it is crystal clear who Kajabi caters to. The most affordable plan, as mentioned, sells for $103 a month. With that, you get support for five products (courses) and 1,000 active members. Therefore, Kajabi is more of a high-powered system for in-depth courses. The company is trying to get you to make quality products, then promote the heck out of them with the intense advertising tools. Premium – $719 per month gets you support for unlimited products, 150,000 marketing emails each month, 25 admin users, unlimited active members, 10 websites, and unlimited pipelines. You also receive an affiliate program and also the choice to remove the Kajabi branding. An Enterprise plan is also sold, but you have to contact the Kajabi company so as to receive more information on that. I’d assume Kajabi is willing to support any enterprise size, so that you can customize your plan. Kajabi does not provide a free plan but it does offer a free trial on all plans so that you may try the software. Generally, Kajabi offers a 14-day free trial but you can receive a 28-day free trial as part of their Kajabi Hero Challenge. 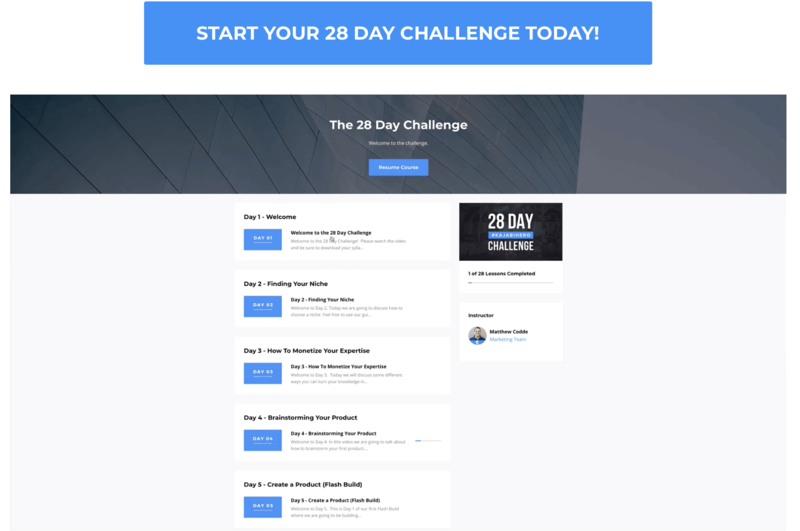 When you take this Challenge, over the next 28 days Kajabi will walk you through all you need to do to build your first digital product and make your first sale. .All within 28 days! The live chat and email support are provided 24/7. So, when you encounter a situation with your course website, you can contact one of the live chat representatives, regardless of what time it is. I asked a question and they came back to me in 20 mins. Of course, it doesn’t always happen so quickly and they do not have a guarantee to answer you within 20 mins. But for me, this reveals a good support. If you purchase a yearly plan, they will provide you two 1-on-1 lessons that last an hour. During those lessons, they will take you hand by hand and reveal how you can begin using Kajabi. Webinar and event options are provided for the Premium plan clients, but everyone can get the Kajabi blog and the help center. And you know what, Kajabi does a reasonably good job at all of those functions, and they are always developing and adding more features. But what almost always astounds me is the live customer care. They provide 24/7 live chat, and the longest I have ever had to wait (and I’ve chatted at all times of night and day!) Is three or four minutes, once. Every other time (and there have been many!) I’m almost instantly connected to somebody. And these people are awesome. They will get you the answer, help you troubleshoot your problem, and also tinker around with a few codings or options on the page to make it work if you are trying something a little more different and can not quite get it to work correctly. Seriously. The support staff is the best! If you don’t classify yourself as a”techy” individual, and you know, without a doubt, that you do not want to learn how to do any type of custom coding, Kajabi should be at the top of your list for consideration. 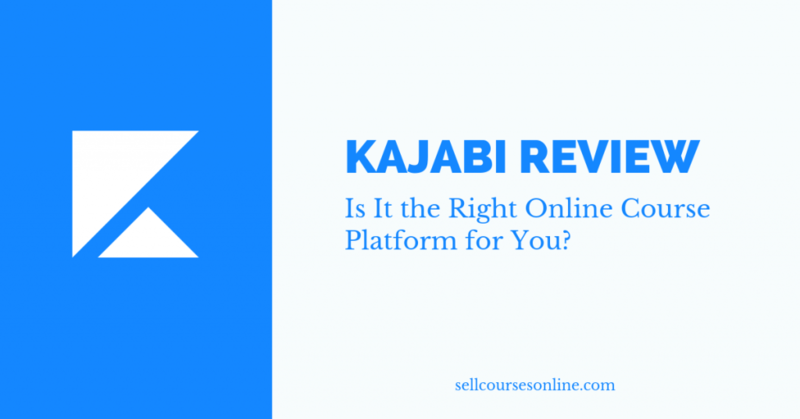 Because many folks end up trying to pick between Rainmaker or Kajabi, in a sentence, I’ll sum up the recommendation like this: Kajabi is much better at developing a membership area for online courses than Rainmaker.